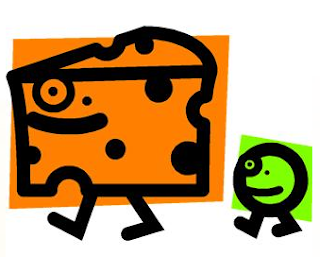 Other Food: daily devos: Big cheese or Barnabas leadership? In a recent guest blog post on Michael Hyatt's blog, Jeremie Kubicek (author of Leadership is Dead: How Influence is Reviving It ) says, "To be a true influencer in the lives of those you lead, you must understand a simple but powerful question. It is one your followers are asking. It goes like this: 'Are you for me, against me, or for yourself?'" The early Christians who started a church in Antioch with Gentile members (Hellenists) would have said Barnabas was for them. For when the Jerusalem elders found out about this unheard-of thing (Gentiles coming to faith in Jesus in great numbers) and sent Barnabas to check it out he "was glad" and "encouraged them." In fact after spending some time with this vital and growing body, he had an idea. He fetched the relatively new Christian Saul (Paul) to help, and in this way encouraged the launch of another apostolic career. I read this and think — man with a clear conscience, without obvious personality flaws, someone who, after you spent time with, you would feel better, cleaner, nobler than before. His goodness ruled out jealousy, envy, personal ambition allowing him to embody the quality of love that prefers others above oneself. - full of the Holy Spirit. The observable difference the Holy Spirit brought to the lives of the early Christians included authority, power, and a certain nonchalance when it came to being intimidated by lesser authorities. Barnabas's life must have had that sense of moving to the beat of a different drummer. Barnabas was a "yes" man. He believed in God and others. Full-of-faith people are positive, optimistic, aware that with God things are possible that could never happen without Him. I ask myself, how would my followers respond to Mr. Kubicek's question about my leadership. What would your followers say about yours? If they would say that we are first and foremost for ourselves or worse, against them, perhaps Barnabas and his leadership model have something to teach us. PRAYER: Dear God, thank You for Barnabas's example of good leadership. Please give me insights into the way I lead others. Help me to be for them. Amen. "I have had dozens of leaders that I have appreciated who have been deeply focused on themselves first and foremost. The problem is that they are not memorable. Therefore, they are not significant in my life. Oh, but I do remember those who were for me. Not only do I remember them, I revere them and value them as leaders and friends. These leaders believed in me, listened to me and appreciated my gifts. Not only that, but they intently invested in my life in significant and valuable ways." Read all of "The most important question you will ever be asked as a leader"